A guide to Megève ski resort, including practical information on hotels, restaurants and pistes. Taken from ‘Where to Ski and Snowboard 2015’ By Chis Gill and Dave Watts. Megève has a medieval heart but it was, in a way, the original purpose-built French ski resort – developed in the 1920s as a response to Switzerland’s irritatingly swanky St Moritz. Although Courchevel long ago took over as France’s top resort, Megève’s smart hotels still attract the old money. Happily, the rest of us can enjoy it, too. Megève is in a lovely sunny setting and has a beautifully preserved, partly medieval centre. Visitors are mainly well-heeled French people, who come here for an all-round holiday. The skiing divides into three sectors. One is directly accessible by lifts from close to the centre and from the southern edge of town, another from an elevated suburb or from an out-of-town lift base; these two are linked by cable car. The third involves a bus or free horse-drawn sleigh, for most people. Village charm, Old France at its best. 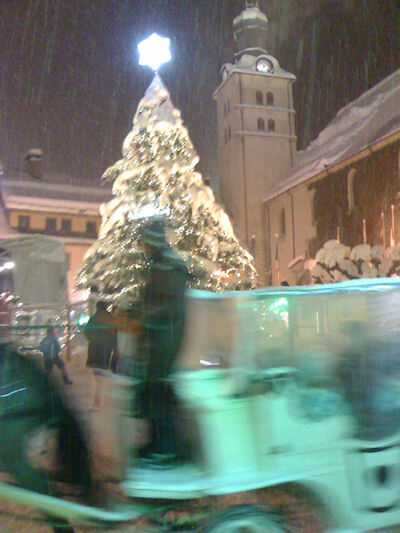 Megève’s charming old centre is car-free and comes complete with open-air ice rink, horse-drawn sleighs, cobbled streets and a fine church. Lots of smart clothing, jewellery, antique, gift and food shops add to the chic atmosphere. Scenery, Beautiful town, beautiful views. The slopes are prettily wooded, but what earns Megève its five stars is the view of Mont Blanc from many of the runs – especially the red Epaule along a ridge above St-Nicolas-de-Véroce.